And Novarius is mostly painted. Or is painted, if I decide to not bother with the OSL on the beacon light thingy on the base there. 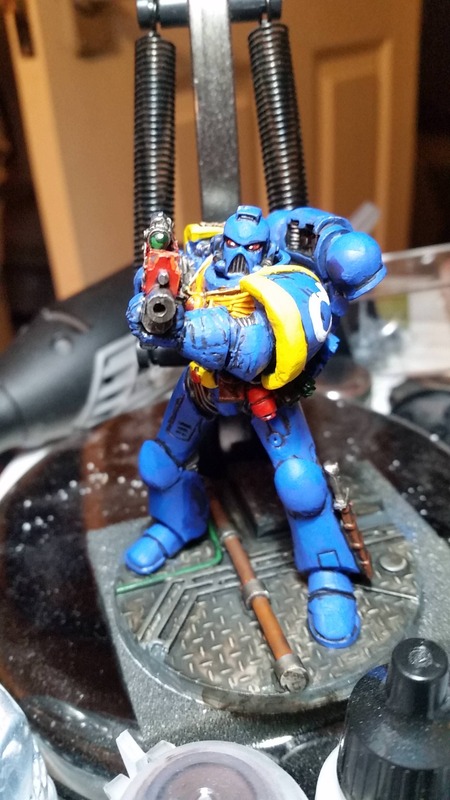 Once I'm sure I'm done with this marine, I will need to work on the next marine. In the meantime, Antoninius legs are pinned to his base. 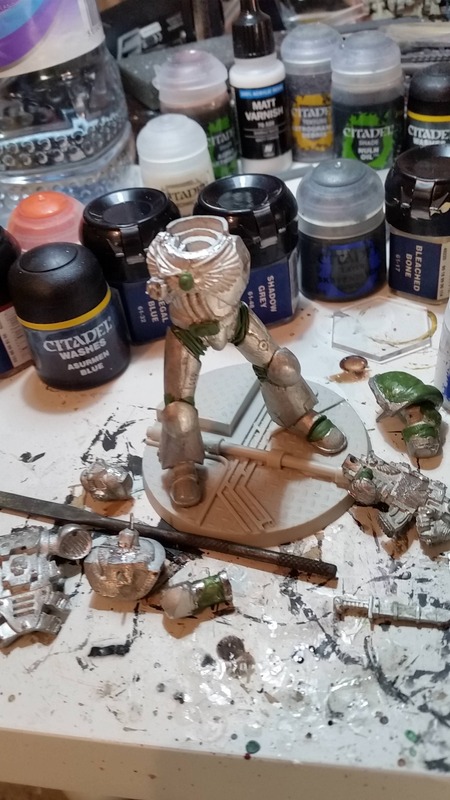 I've done the GS on the leg knee joints, the left shoulderpad, the hands on the bolter. 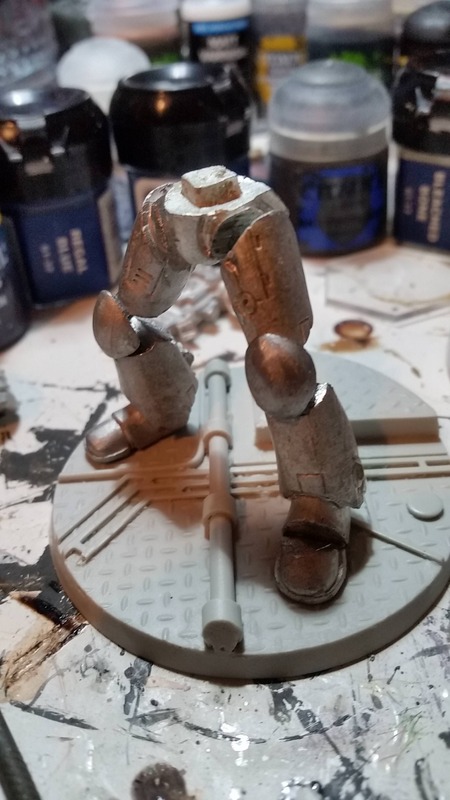 Still needs a tiny bit more GS work to tidy up the left knee joint, and then I need to glue everything in place before I can do some GS work on the elbow region of the right arm, but once all that is in place, it should be good to go with undercoating. Okay, now I need to GS that right elbow, and the joins between arms and body once the superglue finishes drying. And maybe GS a wrist as well, not sure. Looking good. The pair of them look like they'll be raining hellfire down on their enemies before too long. 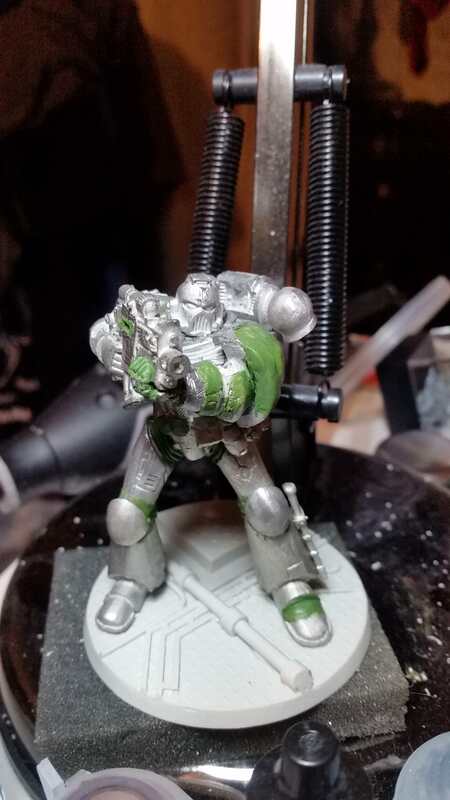 If I had some criticism, it's that the greenstuff on the shoulder pads doesn't look completely smooth. Fine sandpaper, or a wet/dry block is useful for getting larger sculpted surfaces like that smooth. I've got a couple of files which should smooth that up on the next three suspiciously light marines then. For these two I'm just going to roll into the roughness, and pretend it's battle damage from heretics hitting those big shoulder pads (they get a bonus point of armour on their left arms due to the shoulder pads being thickened for exactly this reason - they shoot like this, so the left shoulder pads take more damage than the right (that's my excuse and I'm sticking to it!)). 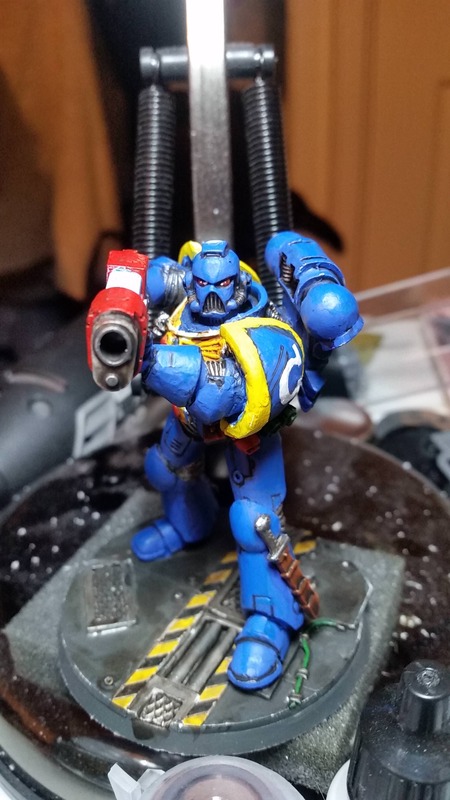 Given that I'm going to be doing more than ultramarines, and I've got two more marines that are mostly made of metal that I need to deal with (not counting Cypher Mk2), I'm thinking I'd like to get those dealt with first. 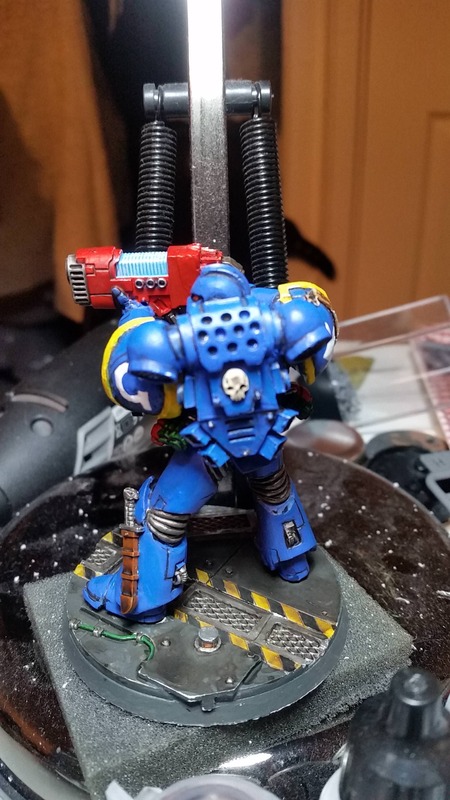 One has a helmet, so he could be anything, like the 5 other suspiciously light marines I have, which all also have helmets (three of which will be ultramarines, as noted). 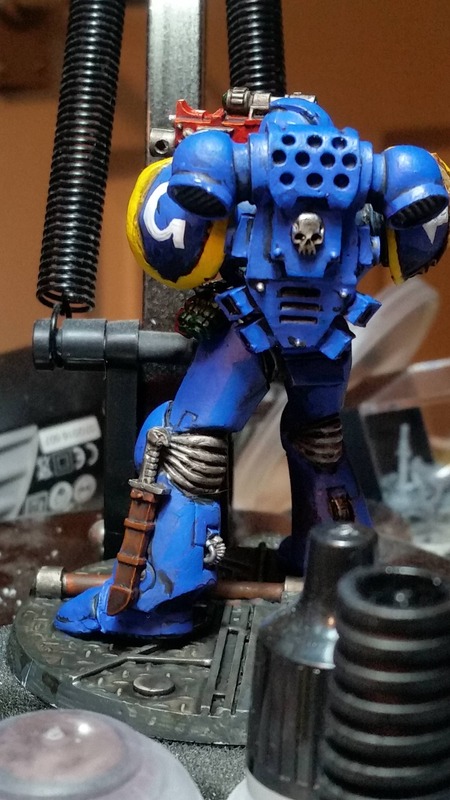 This leaves me this last mostly metal marine (again, not counting Cypher Mk2, when I eventually get around to him), to do something with. I have selected this pile of bits to come up with an idea. 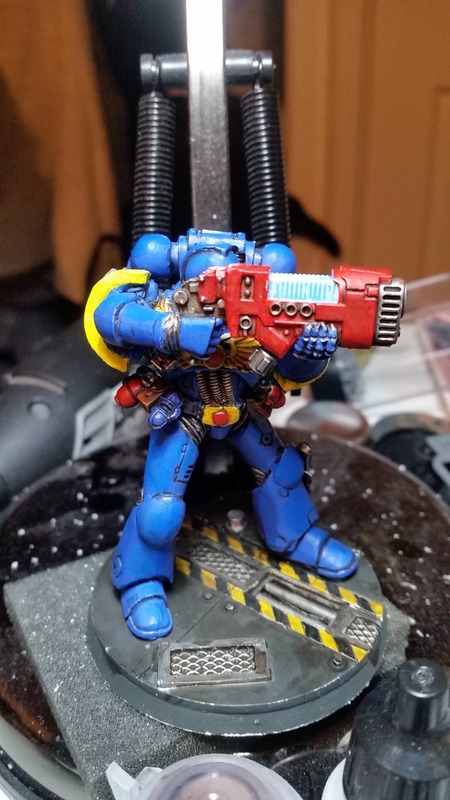 Now I could be boring, and give him a plasma pistol and power sword, and try to come up with another possible chapter for him (not Ultramarines, Imperial Fists, Crimson Fists, or Blood Ravens, as those are what all the other Not Cypher marines will be). 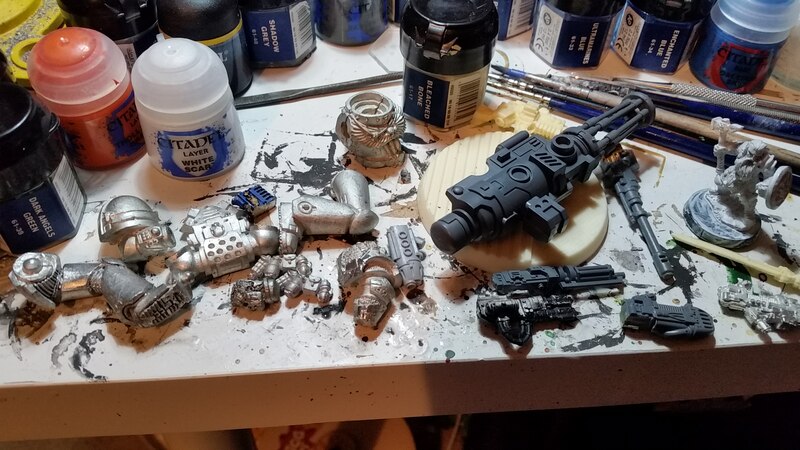 Alternatively, I could build him with some random crazy gun (possibly including that spare giant gun from the riptide, because space marines and giant whirling cannons sound fun), and either create my own chapter for him, or maybe paint him up as a Reviler - those are the ones that keep attracting the attention of the Inquisition, right? Or is it Relictors? E: it's the Relictors, and they are officially Excommunicate Traitoris. 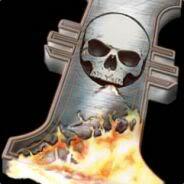 Another alternative would be a nicely battered Lamenter, which I think is what I will go with, maybe. Probably toting that giant cannon, because why not. No point having a giant cannon if you're not going to use it, right? I'm not one for casting parts (or models). And I've already got all the space marine models I need - I just need to build and convert them! But if I were to need bits, we do have a number of competent casters on the forum already to whom one could be pointed if in need . 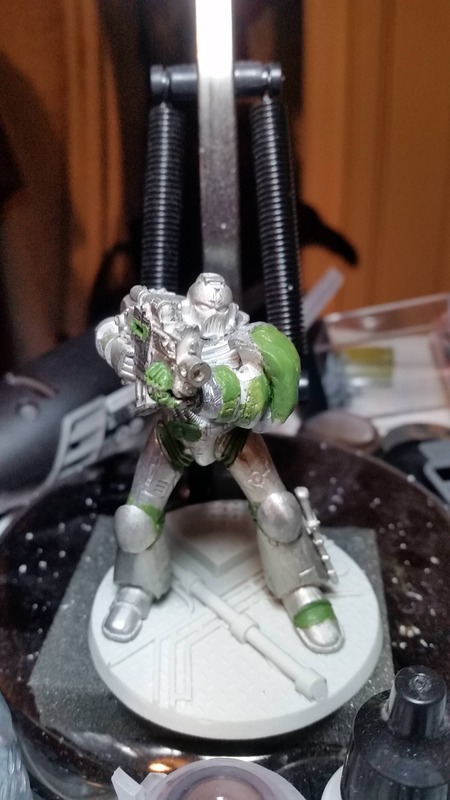 Ah I see, I've been experimenting with the instant mold since I've only managed to get my hands on 3 Space marines from eBay and I can't decide between a chaos warband or loyalist so I decided to attempt both, I've had mixed results so far but practice makes perfect. 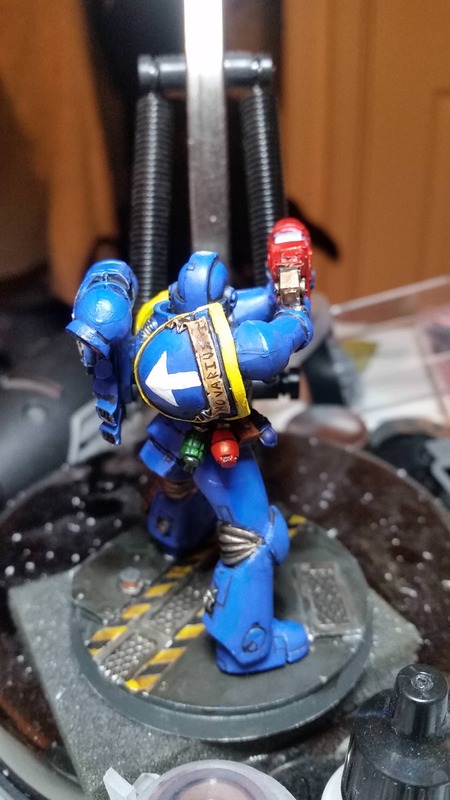 3 suspiciously light space marines destined to be the other three of a five man squad of ultramarines. 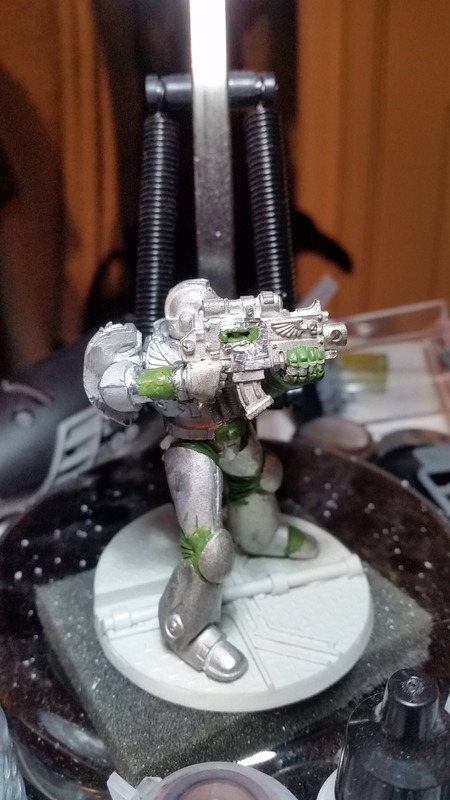 1 mostly metal marine that I can't be bothered to acquire a helmet head for, so I'm thinking he'll probably be an archeotech-assault-cannon-toting Lamenter who forgot his helmet. And I ~think~ that's it. 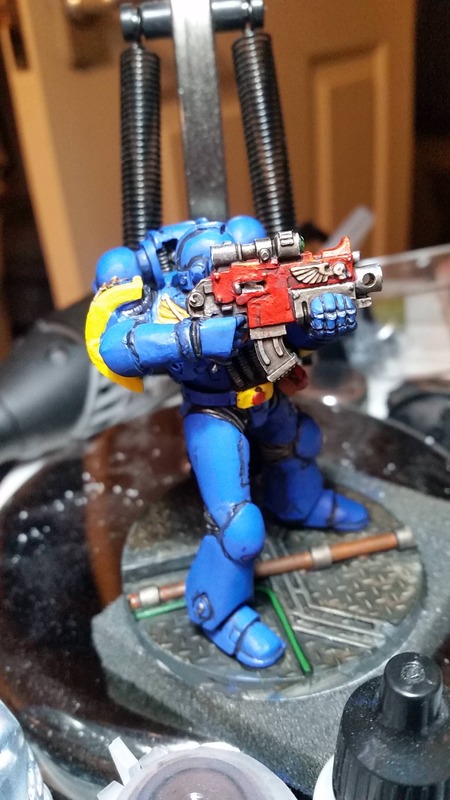 I'm currently taking a break from 54mm space marine construction and painting, so that I can pursue trying to actually start (and finish) painting 100 ish 28mm space marines in various chapter colours (not counting the space marines I stuck in another case for purposes other than official 40k 8th edition wargames). 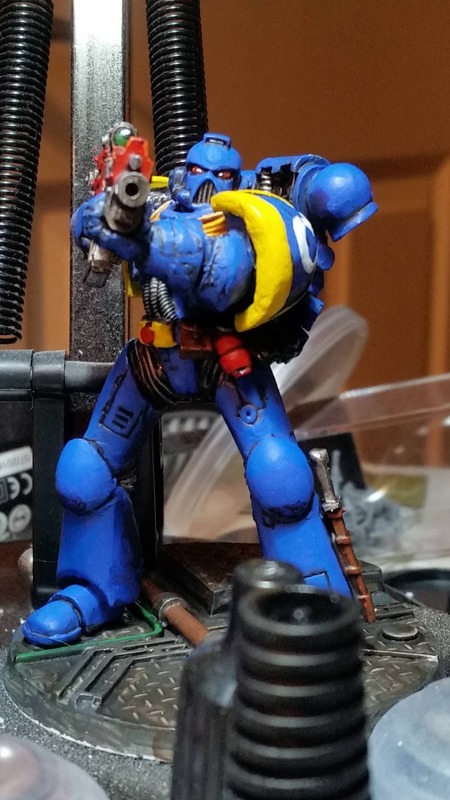 Just a slight criticism, but its mainly a criticism against most GW marine models, is that the guys's you've mad have their legs very far apart. Otherwise, I was going for the "braced for firing" stance with these two. 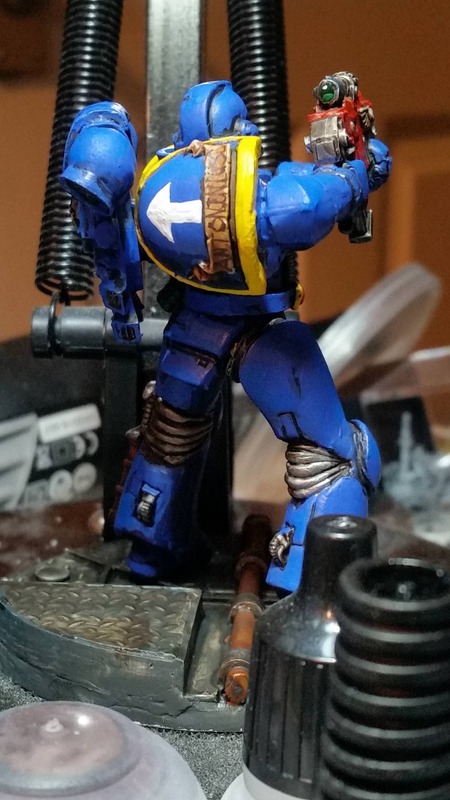 The other three (suspiciously light) marines for the Ultramarines will be a little more dynamic. As for the rest, we'll see what I come up with. Yeah..... GW's proportions seem a little (massively!) off. 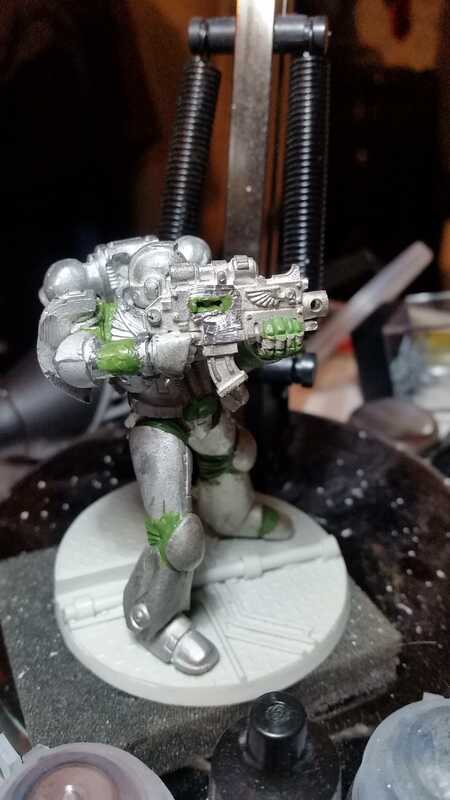 When I eventually get round to doing my other Marines I'm going to sort out the hips and thigh sections (his thighs are too narrow for my liking too! ).